Few recipes concentrate the flavors of the main ingredient better than a French shellfish bisque. This is no mere soup or stew, it is a full-on barrage of flavor that makes everyone stop talking at the table: You just want to savor this soup in silence. Such an experience has its price, however. This is not an easy recipe, nor is it quick. Save this one for weekends, holidays, date night or other special occasions, as it takes most of the day to make. But it is more than worth the effort to transform the humble crawfish into one of the highlights of French haute cuisine. 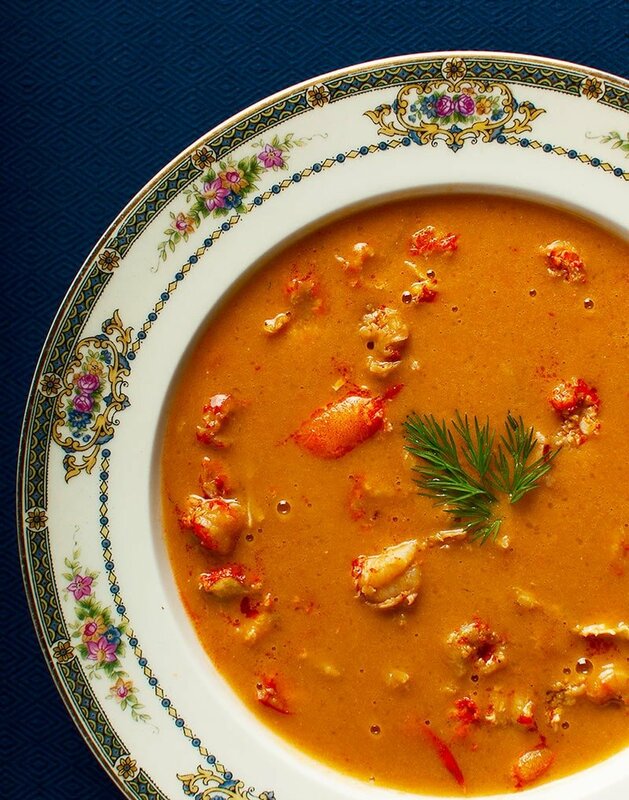 Oddly, I owe much of the technique behind this recipe to Julia Child, whose lobster bisque recipe in her Mastering the Art of French Cooking is a masterpiece. I say oddly because I independently decided to make two of the key components to her bisque — crawfish butter and crayfish broth — without even knowing about her recipe. Why crawfish? Well, I live 3,000 miles from New England, where the best lobsters live. And yes, I know I could use California spiny lobsters, but there’s something about them I am not fond of. It’s not that spiny lobsters are bad per se, it’s that I always find myself comparing them to Maine lobsters, and the spinies simply don’t cut it. 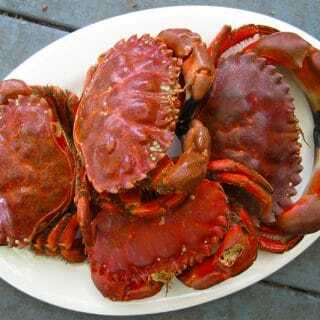 I could of course use Dungeness crab, which would be truly awesome. But I happened to have a bunch of frozen crayfish lying around, leftover from an epic crawdad-hunting trip I took with my friend Mark last July. I knew I wanted to make bisque even then, so I made the crayfish butter and broth and froze it. This can be a great time-saving measure when making this soup. The broth and butter can be made well ahead, and frozen for months before you make the soup. Once you have them in hand, the bisque comes together in less than 30 minutes. The end result is pure luxury. You sit there looking at a soup so rich with crayfish, crabs or lobsters that the whole thing is a warming, welcoming orange. 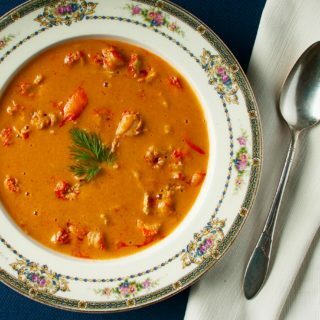 The texture of the bisque is velvet, and you taste the seemingly impossible combination of silky cream, buttery crayfish and tangy hot sauce. Yes, hot sauce. A couple splashes is all you need to add a touch of acid and heat to the bisque. The key for me, however, is the crayfish meat in the bisque itself, which gives you something to aim for when you are eating this with a spoon. Not every bisque includes this, but I think it really needs it, especially if you are serving this as a main course. 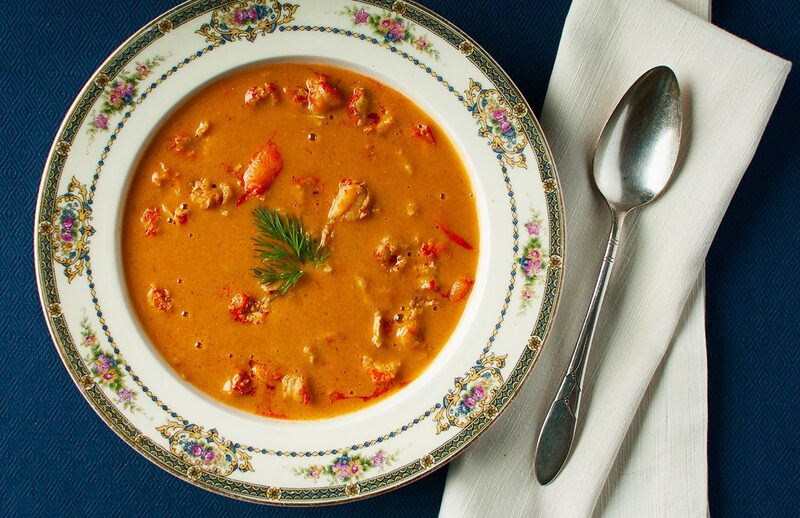 Crawfish bisque is a classic for a reason. You’ll see when you make it. While I call this crawfish bisque, and it is, know that you can have equally good results with lobsters and crabs. Shrimp will also work, but they will not give you quite the same pretty orange color. This recipe takes a bit of time, but no part of it is especially difficult, and I will walk you through the steps below. Once you make the broth and butter, you can store them in the fridge for a week, or freeze them for up to 6 months. With these already made, the bisque itself comes together very quickly. To make the crawfish butter, smash the shells to a pulp. This can be done in a mortar and pestle, or in a strong blender or food processor -- or with a mallet in a bowl. You really want to mash everything well so you get more flavor from the shells. Melt the butter in a small saucepan and add the shells to it. Cover and put into a 170°F oven and let this cook for 90 minutes, stirring now and again. Strain the butter through a fine-meshed sieve that has a paper towel set inside it; this filters all the debris out. Pour into a container and let it cool. TIP: For long storage, let the butter solidify and pop it out of the container, leaving behind the gellified liquid at the bottom of the container. Leaving this in contact with the butter over time can make it got rancid. To make the broth, heat the oil in a large stockpot over medium heat. Add the crawfish shells and smash them to bits with a potato masher. Crush and stir them as they cook until they are all in pieces. Let this cook for a few minutes, then mix in the fennel, carrot and onion. Cook for 5 minutes, stirring often. Mix in the garlic, dried mushrooms and tomato paste. Turn the heat as high as it will go and stir-fry this for 2 minutes. Add the vermouth and stir well. Let this boil for 1 minute, then add enough cool water to cover the shells by 1 inch. Add the bay leaves and let this simmer gently for 90 minutes to 2 hours. Do not let it boil. Strain the broth by pouring it through a fine-meshed sieve with a paper towel set inside. Set aside or chill quickly and store. Heat 2 tablespoons crawfish butter in a large soup pot over medium-high heat. Saute the onion until soft and translucent. Do not let it brown. Pour in the vermouth or brandy and let this boil for a minute. Add the rice and crawfish broth and bring it to a gentle simmer. Simmer until the rice is soft, about 25 minutes. Add salt to taste. Pour the soup into a blender along with 1/4 pound of crayfish meat. Puree, in batches if you need to. Wipe out the soup pot and return the pureed soup to it. Heat the bisque over medium-low heat just to the steaming point. Add the rest of the crawfish meat and heat for 2-3 minutes. Mix in the heavy cream, then stir in the remaining crayfish butter 1 tablespoon at a time. Serve at once, garnished with the herbs. Serve this with crusty bread and a green salad as a main course, or as part of a larger meal. Cajuns make a slightly different version of this bisque and serve it with a spoonful of rice in the center of the bowl, which is another serving option. You can find dozens of recipes for crawfish, crabs, lobsters and shrimp right here on Hunter Angler Gardener Cook! Made this recipe this past weekend. Goodness. Hank, marry me. Seriously.